Our enthusiastic gang of volunteers were ready and waiting to greet our ponies as they came off the lorry at Lowlands. Badger, Kiera, Marco and Alfie had all enjoyed a muddy roll overnight, but were soon clean, shiny and ready to compete with our 5 riders. Competing against riders from 4 other Groups, everyone took part in the Handy Rider course, with some high scoring rounds. In the junior class Scarlett thoroughly enjoyed her round on Kiera and completed all the activities with enthusiasm, supported by her helpers, and was rewarded with a 6th rosette. Independent rider, Isabella, riding Henry, scored an amazing 105 to win her led class and the Junior Handy Rider Trophy for the highest score of the day. A brilliant result and we wish Isabella good luck at the Championships. Our star performer in the senior section was Jo, riding Kiera. She completed a super round, provided her own running commentary on her progress round the course and won the class. An amazing achievement! Matthew, riding Badger, remembered the whole course unprompted and showed good control to come a close 2nd, and Holly (Badger)held her reins and showed good steering, especially round the pond, to gain a 4th rosette. The new partnership of Arthur and Alfie proved a real success. In his first ever competition, Alfie was completely unfazed, responded well to Arthur’s instructions and together they gained a very creditable 3rd place. Arthur on Alfie – ready! Special mention to our teams of helpers, who give our riders so much confidence and sense of achievement by allowing them enough time to perform each activity and letting them do as much as possible themselves. Matthew, Jo and Arthur also proved their knowledge of grooming and looking after ponies by taking part in the Grade 1 stable management quiz and gaining 3rd, 4th and 5th rosettes respectively which was very well done. Isabella gained a creditable 90% in the more advanced Grade 2 stable management quiz. The busy day was rounded off with a picnic and riders were presented with their rosettes. Jo was absolutely delighted to receive the Rosemary Stretch Memorial Award, for the best senior handy rider score which was presented by Rosemary’s sons and Isabella won the Junior Rosemary Stretch Memorial shield. These are inaugural trophies so Jo and Isabella’s names will be the first to be engraved on them. Very special! It was lovely to welcome along parents and supporters to share in the achievement and enjoyment of our riders. 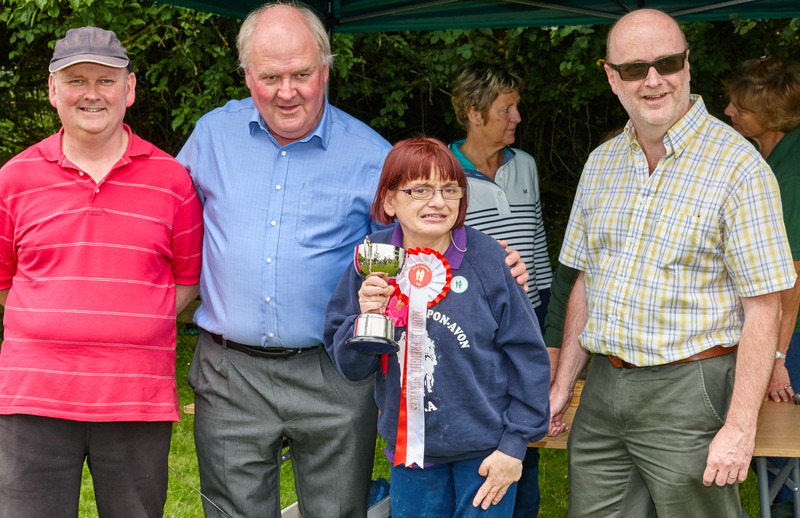 It was also an opportunity for us all to thank Ro Pudden for hosting the event once again, as well as to recognize her huge contribution to RDA in Warwickshire over many years by presenting her with the Rachel Goldsmith Memorial challenge trophy. Once again our ponies were a credit to the Group. Other than Badger’s occasional whinny to his girlfriend (Kiera), they all behaved perfectly. Newbie Alfie is quickly becoming a valued member of the equine team. As we didn’t have a rider for Marco, he was lent to other groups and was very popular with their riders. Last, but not least, many thanks to all our helpers. Whatever the occasion, ‘Team Stratford’ swings into action, ensuring our riders have a happy and memorable day. Whether its practising beforehand, cleaning tack, preparing ponies, helping clear up, or volunteering to go back with the lorry to unload the mounting block – there’s always willing hands around! Thank you for your time and commitment – it is appreciated.